According to a recent New York Times article written by Alyson Krueger, the cry “Head to the hills” is becoming more common as the talk of climate change continues to grow. Whether you believe the reports or not, things are changing in the world around us and people are taking notice. This article is interesting in that it focuses on people deciding that they need to move to, or at least own land at higher elevations that won’t be as impacted if sea levels rise as predicted. For centuries humanity has fled to the mountains in times of unrest. There is simply something about them that makes one feel safe. 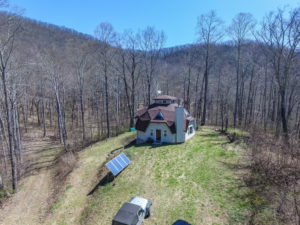 Here in the mountains of western North Carolina, we have many places wherein one can relocate and settle down to a more sustainable lifestyle away from all the negatives that are associated with highly populated urban areas. In fact, I have one PhD. MD client who absolutely will not look at anything below 3,000′ in elevation out of concern over the rising tide. For a long time, this was the talk of survivalists and conspiracy theorists, but more and more mainstream folks are jumping on board. Do a Google search and you’ll find all kinds of big name investors, CEO’s and such purchasing rural farms and mountain land in anticipation of changes brought about by the rising temperatures and sea levels. Its not just the change in sea level, but the civil unrest and instability of the economy that could follow if the trend continues. That’s the gist of the New York Times article. Read it here. It goes on to address the investment potential of purchasing land at higher elevations as low lying lands become inundated with water.